In theory, preventing condensation within a mechanical insulation system should be simple: maintain the surface temperature of the insulation above the dew point, and prevent any intrusion of moisture or air into the system, especially between the insulation and the piping. In practice, however, failure to control condensation is relatively common. There are several flaws and performance issues that can result in poor condensation control. When insulation is missing, damaged, or poorly installed, it automatically loses its effectiveness and can lead to major problems. For example, failures are often caused by the inadequate performance of sections of piping that are difficult to insulate, like pipe hangars and valves. In some other instances it’s a design flaw that results in condensation, such as not leaving enough clearance for the installation or failing to specify adequate insulation materials. If your main goal is condensation control, all areas need to be insulated properly. An insulation system is only as good as its weakest link. The obvious result of too much condensation is moist insulation, particularly if the insulation is closed-cell. And it’s that moisture that causes problems. The thermal efficiency of the insulation system seriously decreases when it’s compromised by moisture. In fact, a one percent weight gain due to moisture can lead to a 7.5% decrease in thermal efficiency. That inefficiency leads to more energy escaping the process, which in turn leads to higher operating costs and increased energy bills. The reduction in the insulation value can eventually lead to a failure of the entire system and the need for serious repair and—more likely—replacement. Corrosion under insulation (CUI) is a well-known condensation-related challenge in the industry. Pipe corrosion under insulation is a slow but debilitating (and potentially expensive) problem. If the corrosion becomes too severe, the piping will need to be replaced, which will most likely result in shutting down the facility in order to complete the work. 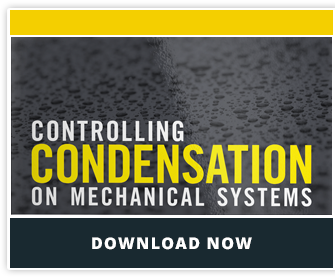 Mechanical insulation is an important tool for personnel protection in any facility, but that benefit becomes compromised when condensation takes over. Condensate can drip and accumulate in ceiling tiles or floors (and may even form ice), causing slipping hazards. It also has the potential to drip onto electrical equipment which presents the dangers of shock to workers and damage to expensive equipment. Condensate dripping can also contaminate any product that may be being produced underneath the system. Condensation can also cause mold and mildew on the insulated surface itself as well as the surrounding areas. This is not only dangerous to any workers in the immediate facility, but has the potential to impact the entire building if the mold or mildew get into the HVAC system’s air stream. Controlling condensation is not a one-time deal. Periodic maintenance and reevaluation of your insulation needs will help prevent these negative consequences of condensation control failure.